Pantheon Books, New York, 2005. 261 pages. 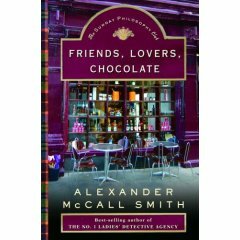 Friends, Lovers, Chocolate is the second book in Alexander McCall Smith’s Sunday Philosophy Club series, featuring Isabel Dalhousie, the editor of the Review of Applied Ethics. In this book, Isabel temporarily takes charge of her niece’s delicatessen and meets a man who has recently had a heart transplant. This man has been having disturbing visions of a face. Could it be that the face in his vision had something to do with the death of the one who donated his heart? Isabel’s curiosity gets the best of her, and she feels compelled to investigate. After all, ethically speaking, when something like that comes your way, is it right to do nothing? I found the answer to this mystery a bit anticlimactic and the story itself pleasant, but not terribly absorbing. Fans of Alexander McCall Smith will want to read it, but I don’t think it will make many new fans. In this book, Isabel Dalhousie sounded quite a bit like Mma Ramotswe, and I wasn’t sure I liked that coming from a different character. Still, this does make pleasant reading. The way Isabel ponders ethical questions will also get the reader thinking.